1. Your check engine light comes on: The car’s computer continuously monitors the signals from the oxygen sensors. If it detects a problem with one of the sensors or its circuit, it will turn on the check engine light. It will also set a trouble code and turn on the check engine light if other engine problems are causing the signal to be out of range, even when the amount of fuel is adjusted by the computer. 2. Poor engine performance: The computer relies on the oxygen sensor for information about the air-fuel mixture. A faulty oxygen sensor can cause the computer to supply the engine with too much or too little fuel. This can cause the engine to misfire and run rough. 3. 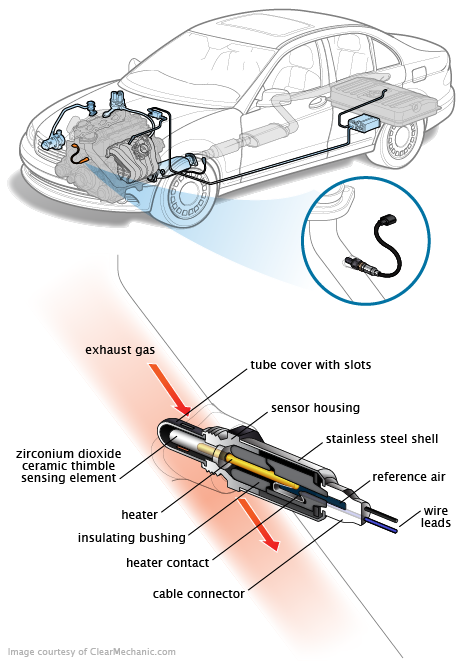 Poor fuel economy: Similarly, a bad oxygen sensor can cause the computer to supply the engine with more fuel than it needs, resulting in poor fuel economy. Oxygen sensors can fail if they are contaminated with oil, coolant or other fluids. If fluid contamination has caused the problem, the source of the leak must be resolved first, or the new sensor may get ruined, too. Do not use carburetor cleaner on engines with oxygen sensors; instead use oxygen sensor-safe throttle body cleaner. While replacing an oxygen sensor is relatively straightforward, it requires using a scan tool to identify the OBD-II trouble code and diagnose the problem, and typically involves lifting the car. You’ll need a special oxygen sensor socket to remove or install the part without damage — a wrench can easily kill a good sensor. Therefore, it’s usually best left to the professionals. The oxygen sensor compares the level of oxygen in your car’s exhaust stream to that of the surrounding air. It then generates a corresponding voltage signal. This voltage tells the engine computer the relative amount of oxygen in the exhaust as well as the temperature of the sensor in real time. Depending on where the sensor is located in the exhaust stream, this signal is used to send the ideal amount of fuel to your engine while it’s running, and can turn on your check engine light to alert you to an emissions problem caused by any component in the engine. The engine computer relies on accurate information from many different sensors to adjust the ratio of air to fuel in your engine. The oxygen sensor is the only one that tells the computer what actually happened with the amount of fuel it just sent to the engine. Most of the other sensors feed information about the air entering the engine, temperature, and other data. There are two primary types of oxygen sensors (also called O2 sensors): upstream (front) and downstream (rear). Depending on the make and model of car, there may be two, four or even more oxygen sensors on the vehicle. Upstream: The upstream sensor is mounted before the catalytic converter, as close to the engine as possible. Your car’s computer uses this sensor’s data for fuel control. If the sensor detects too much oxygen in the exhaust — called a lean condition — the computer will add more gasoline to the mix. On the other hand, if it detects too little oxygen in the exhaust — called a rich condition — it will reduce the fuel. The voltage signal from this sensor should constantly fluctuate from rich to lean, allowing the computer to find the ideal air-fuel mixture. Downstream: The downstream oxygen sensor is mounted after the catalytic converter. It’s used to monitor the efficiency of the converter, making sure it’s cleaning the engine’s exhaust effectively before releasing it into the atmosphere. A good downstream sensor should put out a relatively steady voltage signal. Upstream and downstream oxygen sensors are often calibrated differently, so it’s important to install the correct sensor in the correct location. 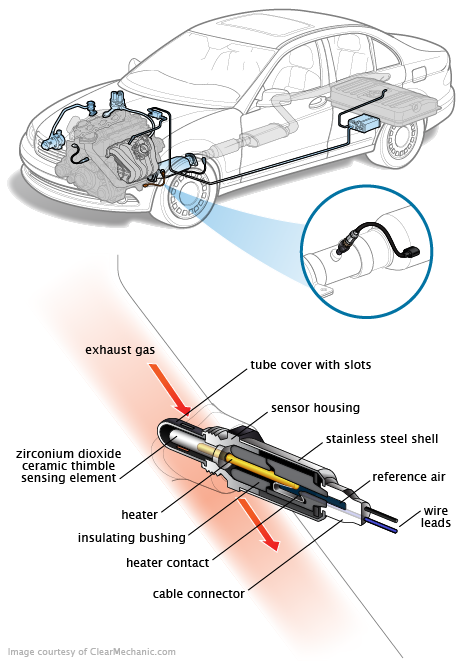 Alternatively, many modern cars use a wide-band upstream oxygen sensor (also called an air-fuel ratio sensor) instead of a traditional oxygen sensor. This is basically a “smart” oxygen sensor that is able to provide a real-time air-fuel ratio and is easier to monitor. What is the difference between heated and planer sensors and which one do i need for the rear sensor?